This page is good but See Pa­lermo is even bet­ter! It's an en­tire site dedi­cated to this city. See Palermo! Sights of a timeless city. Personal tours of Palermo with your own guide, at your own pace, and your own itinerary. Things to see in Palermo are indexed by zone (see map) according to their locations within the city, and by category in our Sights To See index. Names of a few of the more prominent sights listed here correspond to the numbers indicated on the map. Though based on actual parts of the city, the "quarters" indicated here are generalized; the Magione Church, for example, isn't actually in the historical Kalsa Quarter but is fairly close to it, while the Chinese Villa, Mondello and Mount Pellegrino, though reached from Via Libertà, are not actually very near it. 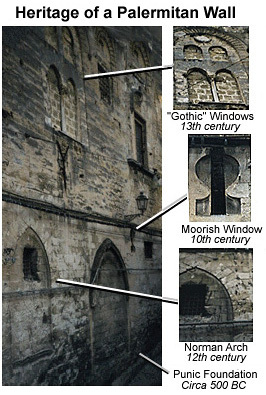 The history of Palermo follows below. 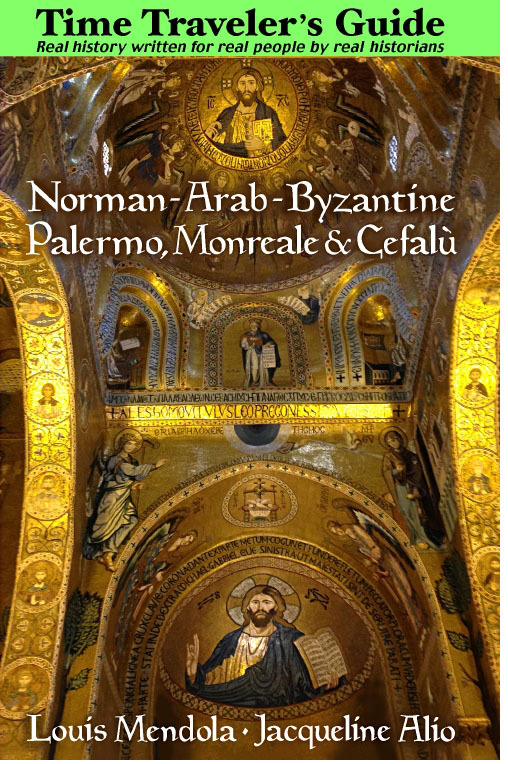 For a complete travel guide we suggest our sister site, See Palermo, and for tours of Palermo visit our Sicily tour guide page. Link to a district's page from these titles or by clicking on the map below. Niscemi's Cave and Addaura Cavern, in the cliffs of Mount Pellegrino, were both inhabited in middle neolithic times and boast some remarkable wall drawings. This was the dawn of European prehistory. Palermo's recorded history begins four millennia later. Founded by the Phoenicians, who named it Ziz, Palermo was settled in the eighth century BC as a port. Its development paralleled that of Solunto and Motia. Archeologists generally agree that the Phoenicians were compelled to develop these cities because they were forced out of eastern Sicily by the Greeks, but this civilization's presence in western Sicily seemed inevitable. The Greeks called the city Panormos, meaning "all port." The Latin name, still used in Catholic Church documents well into the nineteenth century, was Panormus. The Phoenicians' descendants and successors, the Carthaginians, made Panormos a center of commerce, and it was their base port, in 480 BC, for the navy that was defeated in the Battle of Himera. In 276 BC, Panormos finally fell to the Greeks. The Punic Wars followed, and the city was part of the Roman Empire from 253 BC. Phoenician and Roman Palermo extended from the port area along what is now Corso Vittorio Emanuele to Corso Calatafimi in the area beyond the Royal Palace (viewed from a distance in this photo of the Monastery of Saint John of the Hermits). The Arabs brought the lemon and the orange, cane sugar, and the cultivation of mulberry trees, dates, cotton and hard wheat. They introduced innovative irrigation systems and a novel system of aqueducts. 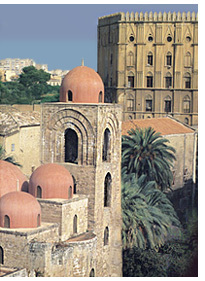 Palermo became one of the Muslim world's most splendid cities, surpassed only by Baghdad. In stark contrast to the Normans' conquest of England, the Sicilian conquest was long and difficult. Only in 1071, almost a decade after they had landed at Messina, did the Normans, led by Robert "Guiscard" de Hauteville, capture Palermo, and then after a five-month siege. Numbering perhaps as many as a hundred thousand, the residents (Palermitans) of this medieval metropolis were Muslims, Christians and Jews from every part of Sicily and every part of the Mediterranean. The island was the place where east met west, and north met south. In the decades to come, Palermo flourished as the wealthiest city of Europe, the victor in a subtle sibling rivalry with another newly-Norman city, London. 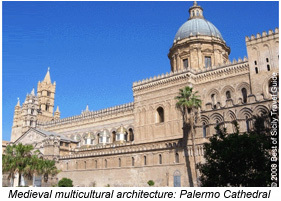 From the eleventh century onward, the history of Palermo is largely the history of Sicily. Despite brief periods of competition from Messina and then Catania, it was the seat of the island's government. By the eighteenth century, Palermo had become the place of residence of most of western Sicily's nobility. Its splendid Baroque palazzi are their legacy. If Milan seems to ignore the rest of Italy, if Rome presumes to be the national capital, Palermo exists in a realm neither could ever hope to occupy. The city once boasted a prosperous Jewish community. In 1492, with Sicily under Spanish control, the infamous edict of expulsion ordered them to leave or convert. It appears that about half chose to remain in Sicily as Christians. Its ancient and medieval historical district is larger than that of any other Italian city except Rome and maybe Naples. Southern Italy's entire historical legacy exists along a kilometer of Corso Calatafimi - a Punic cemetery, Roman homes (in Piazza Vittoria), Norman palaces (the Cuba and Royal Palace) and Baroque churches. Perhaps no other street in Europe boasts a heritage so ancient and so varied. There's no other Italian city quite like it. Palermo is an urban paradox. Life in this unique city can be challenging, though most Palermitans seem to have adapted well. Water is rationed; it is provided for a few hours every two or three days, just long enough to fill up the tanks in residents' homes. Air quality leaves something to be desired; in 2000 Via Roma registered the highest level of pollutants of any main street in a large Italian city. Traffic often comes to a complete halt for hours; Via Regione Siciliana, the city's main highway, is infamous for this, especially near the poorly-designed interchange at Via Da Vinci (and McDonalds and the Holiday Inn). Protests often block central streets; these "mini-revolutions" are invariably over by lunchtime. Despite such inconveniences, Palermo remains a jewel of the Mediterranean. No visit to Sicily is ever complete without a visit to Palermo, a city that permits one not just to know this island but to begin to understand it. Throughout Palermo, there are excellent pastry shops and "bars" that serve ice creams, pastries and, during Summer months, granita (flavored ices). If you want to sample these tempting delights in a leisurely setting, we suggest the charming outdoor cafés on Via Principe di Belmonte, which runs from Via Maqueda to Via Roma near the Politeama Theatre. Located in the city's best shopping district, Via Belmonte is closed to traffic, making it Palermo's answer to Rome's Piazza di Spagna or Via Condotti. The city doesn't only offer great cuisine and fascinating history. Palermo also has some very good shopping, and many of the better shops are conveniently located in the city's centre around Via Maqueda and Via Libertà, especially on the side streets, where you'll find shops that sell everything from antiques to Sicilian-made specialty goods like ceramic items and original jewelry. Hotel Reservations are easy with the online reservation system on our travel planning page, where you'll find convenient links to information on flights, hotels, car rentals, restaurants, weather and even travel books.